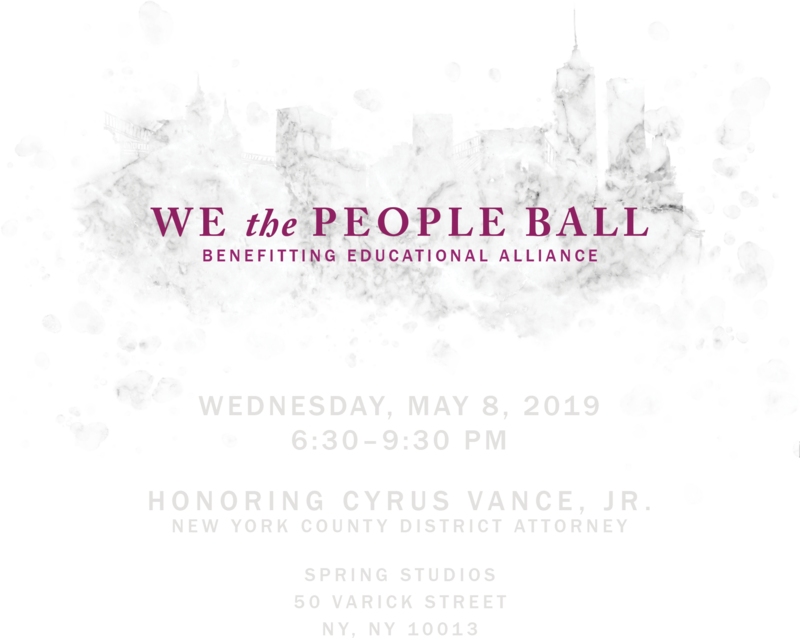 It’s been a spectacular year for Educational Alliance and we invite you to help us celebrate at our We the People Ball. Join your fellow New Yorkers for a can’t-miss evening in downtown Manhattan, as we toast our sucess and share our vision for the future. Mindy Schneider & Michael Lesser M.D. Includes a table of 12 at the Gala in a premier location, company’s or individual’s name on printed invitation and program, company’s logo on website and in printed program, top position in pre- and post- gala news release and other communications with media, recognition from stage at the Gala, and listing in Educational Alliance’s 2019 Annual Report. Includes a table of 10 at the Gala in a prime location, company’s or individual’s name on printed invitation and program, company’s logo on website and in printed program, mention in pre- and post- gala news releases and communications with media, and listing in Educational Alliance’s 2019 Annual Report. Includes a table of 10 at the Gala, company’s or individual’s name on invitation, website and in printed program, and listing in Educational Alliance’s 2019 Annual Report. Includes two tickets to the Gala, company’s or individual’s name in printed program, and listing in Educational Alliance’s 2019 Annual Report. Includes one ticket to the Gala, acknowledgement on select event materials, and listing in Educational Alliance’s 2019 Annual Report. THE VALUE OF YOUR DONATION IS TAX-DEDUCTIBLE TO THE FULL EXTENT OF THE LAW, LESS $300 PER TICKET USED (E.G. $4400 OF A $5000 SPONSORSHIP). IF YOU CANNOT ATTEND THE GALA BUT WOULD LIKE TO MAKE A DONATION TO EDUCATIONAL ALLIANCE PLEASE CLICK HERE.